This article is about the founder of Cheung Kong Holdings. For the son of Lee Shau Kee, see Martin Lee Ka-shing. Sir Li Ka-shing GBM KBE JP (born 13 June 1928) is a Hong Kong business magnate, investor, and philanthropist. He was born in Chao'an, Chaozhou. As of March 2019, Li is the 28th richest person in the world, with an estimated net wealth of US$32.8 billion. He is the senior advisor for CK Hutchison Holdings, after he retired from the Chairman of the Board in May 2018; through it, he is the world's leading port investor, developer, and operator of the largest health and beauty retailer in Asia and Europe. Li was one of the most influential entrepreneurs in Asia, presiding over a business empire with a diverse portfolio of businesses from a wide array of industries, including transportation, real estate, financial services, retail, and energy and utilities. His conglomerate company Cheung Kong Holdings was influential in many sectors of the Hong Kong economy and made up 4% of the aggregate market capitalisation of the Hong Kong Stock Exchange. Forbes Magazine and the Forbes family honoured Li Ka-shing with the first ever Malcolm S. Forbes Lifetime Achievement Award on 5 September 2006, in Singapore. In spite of his wealth, Li cultivated a reputation for leading a frugal no-frills lifestyle, and was known to wear simple black dress shoes and an inexpensive Seiko wristwatch. He lived in the same house for decades, in what has now become one of the most expensive districts in Hong Kong, Deep Water Bay in Hong Kong Island. Li is also regarded as one of Asia's most generous philanthropists, donating over billions of dollars to charity and other various philanthropic causes, and owning the second largest private foundation in the world after Bill & Melinda Gates Foundation. Li was often referred to as "Superman Li" in Hong Kong because of his business prowess. Li was born in Chao'an, Chaozhou in Guangdong Province, Republic of China, in 1928 to Teochew parents. Owing to his father's death, he was forced to leave school before the age of 15 and found a job in a plastics trading company where he worked 16 hours a day. In 1950 he started his own company, Cheung Kong Industries. From manufacturing plastics, Li developed his company into a leading real estate investment company in Hong Kong that was listed on the Hong Kong Stock Exchange in 1971. Cheung Kong expanded by acquiring Hutchison Whampoa and Hongkong Electric Holdings Limited in 1979 and 1985 respectively. In September 2017, Li worked with Alibaba's Jack Ma to bring a digital wallet service to Hong Kong. In March 2018, Li retired at the age of 89 after a 68-year reign over his holdings and assets companies. He continues to serve his conglomerate as a senior advisor and his son, Victor Li, has succeeded him as chairman. From his humble beginnings in China as a teacher's son, a refugee, and later as a salesman, Li provides a lesson in integrity and adaptability. Through hard work, and a reputation for remaining true to his internal moral compass, he was able to build a business empire that includes: banking, construction, real estate, plastics, cellular phones, satellite television, cement production, retail outlets (pharmacies and supermarkets), hotels, domestic transportation (sky train), airports, electric power, steel production, ports, and shipping. In 1950, after learning how to operate a plant, Li founded a plastic manufacturing company in Hong Kong with personal savings and funds borrowed from relatives. Li avidly read trade publications and business news before deciding to supply the world with high quality plastic flowers at low prices. Li learned the technique of mixing colour with plastics that resemble real flowers. After retooling his shop and hiring the best technicians he could find, he prepared the plant for a visit from a large foreign buyer. Impressed with the quality of Li's plant, the buyer placed a large order. A few years later, Li grew to be the largest supplier of plastic flowers in Asia and made a fortune selling them. In 1958, believing rents would continue to rise, Li decided to purchase a site and develop his own factory building. An opportunity to acquire more land arrived after the 1967 riots when many people fled Hong Kong, and, as a result, property prices plummeted. Li believed the political crisis would be temporary and property prices would eventually rise, and bought land from the fleeing residents at low prices. In 1971, Li officially named his real estate development company Cheung Kong (長江實業). Cheung Kong Holdings was publicly listed in Hong Kong Stock Exchange in 1972. During board meetings, Li stated on a number of occasions his goal of surpassing the Jardines-owned Hongkong Land as a leading developer. The successful bid by Cheung Kong for development sites above the Central and Admiralty MTR stations in 1977 was the key to challenging Hongkong Land as the premier property developer in Hong Kong. Despite its size, Jardines decided in the 1980s to protect itself from hostile takeover by Li or other outside investors. The company implemented a cross-shareholding structure that was designed to place control in the hands of Britain's Keswick family despite their less than 10% holdings in the group. In 1984, the company also moved its legal domicile from Hong Kong to another British overseas territory – Bermuda, in anticipation of the transfer of sovereignty of Hong Kong to People's Republic of China in 1997. In an effort to drive forward divestitures of assets in Hong Kong and the Chinese Mainland, Li agreed to sell The Center, the fifth-tallest skyscraper in Hong Kong. With a volume of HK$40.2 billion (US$5.15 billion), the deal constitutes the biggest ever office space real estate sale in the Asia-Pacific region. Li sold the Century Link complex in Shanghai for US$2.95 billion, the second largest transaction for a single building, according to the Financial Times. In 1979, with help from HSBC, Li controlled the Hutchison Whampoa Company Limited, which increased Cheung Kong Holdings control to 12% of the world container port facilities, especially in Hong Kong, Canada (Vancouver), China, the United Kingdom, Rotterdam, Panama, Bahamas and many developing countries. A subsidiary of CK Hutchison, the A.S. Watson Group (ASW), is a retail operator with over 12,000 stores. Its portfolio encompasses retail brands in Europe such as Superdrug (UK), Marionnaud (France), Kruidvat (Benelux countries), and in Asia including health and beauty retailer Watson's store and wine cellars et al., PARKnSHOP supermarkets (and spin-off brands), and Fortress electrical appliance stores. ASW also produces and distributes water products and beverages in the region. CK Hutchison group has the reputation of being an astute asset trader. It builds up new businesses and sells them off when shareholder value could be created. Huge profits were obtained in the sale of its interest in Orange to Mannesmann Group in 1999, making a profit of $15.12 billion. In 2006 Li sold 20% of Hutchison's ports business to Singapore rival PSA Corp., making a $3.12 billion profit on a $4 billion deal. Li has also made a foray into the technology business, where his investment and venture capital firm Horizons Ventures is specifically allocated towards backing new internet and technology startup firms, and bought a stake in doubleTwist. His other firm, the Li Ka Shing Foundation bought a 0.8% stake in social networking website Facebook for $120 million in two separate rounds, and invested an estimated $50 million in the music streaming service Spotify. Some time between late 2009 and early 2010, Li Ka-shing led a $15.5 million Series B round of financing for Siri Inc. In 2011, Horizons Ventures invested in Summly, a website-summarizing app. Notably, the investment made Nick D'Aloisio, Summly's founder, the world's youngest person to receive a venture capital investment at just fifteen years old. In 2012, Horizons Ventures invested $2.3 million in Wibbitz, a company that provides a text-to-video technology that can automatically convert any article post or feed on the web into a video in a matter of seconds. In August 2012, Li acquired a stake in Ginger Software Incorporated. In 2013, Horizons Ventures invested in Bitcoin payment company BitPay. In February 2015, Horizons Ventures participated in a $30 million Series C funding round in Zoom Video Communications. Later in the year, Li participated in a $108 million Series D round in Impossible Foods. In 2016, he continued investments in technology companies and Horizons Ventures led a $55 million Series A round in Blockstream, the leader in blockchain related technologies, and also invested in a startup incubator fund Expa, that works with the founders to build new companies. In 2013 a claim was lodged by the Australian Tax Office (ATO) against Cheung Kong Infrastructure (CKI) to pay approximately A$370 million in unpaid tax, penalties and interest relating to tax disputes concerning SA Power Networks and Victoria Power Networks. The dispute was resolved in 2015 when CKI entered into an agreement with the ATO. No penalty was levied against CKI and a sum of approximately A$24 million was refunded from the A$64 million previously paid to the ATO by CKI. After his almost-70-year-long reign over CK Hutchison Holdings and CK Asset Holdings, Li announced his retirement on 16 March 2018 and the decision to pass his $100bn empire on to his son, Victor Li. Yet, he would still be involved in the conglomerate as a senior advisor. Besides business through his flagship companies Cheung Kong Property Holdings and CK Hutchison Holdings Limited, Li Ka-shing has also personally invested extensively in real estate in Singapore and Canada. He was the single largest shareholder of Canadian Imperial Bank of Commerce (CIBC), the fifth largest bank in Canada, until the sale of his share in 2005 (with all proceedings donated, see below). He is also the majority shareholder of a major energy company, Husky Energy, based in Alberta, Canada. In January 2005, Li announced plans to sell his $1.2 billion CAD stake in the Canadian Imperial Bank of Commerce, with all proceeds going to private charitable foundations established by Li, including the Li Ka Shing Foundation in Hong Kong and the Li Ka Shing (Canada) Foundation based in Toronto, Ontario. Li was the non-executive director of The Hongkong and Shanghai Banking Corporation since 1980 and became Deputy Chairman of the bank in 1985. He was also Deputy Chairman of HSBC Holdings in 1991–1992. His two sons, Victor Li and Richard Li, are also prominent figures in the Hong Kong business scene. Victor Li works directly with his father as Co-Managing Director and Deputy Chairman of CK Hutchison Holdings, while Richard Li is the head of PCCW, the largest telecom company in Hong Kong. They are both Canadian citizens. He has a granddaughter Michelle Sarah Li Se De, who studied at the Chinese International School in Hong Kong. Li is famously plainly dressed for a Hong Kong tycoon. In the 1990s he wore a $50 HKD timepiece from Citizen Watch Co. and plain ties. He later wore a Seiko. In 2016, he wore a $500 HKD Citizen watch. His son Victor Li was kidnapped in 1996 on his way home after work by gangster "Big Spender" Cheung Tze-keung. Li Ka-shing paid a ransom of HK$1 billion, directly to Cheung who had come to his house. A report was never filed with Hong Kong police. Instead the case was pursued by Mainland authorities, leading to Cheung's execution in 1998, an outcome not possible under Hong Kong law. Rumours circulated of a deal between Li and the Mainland. On 4 August 2011 at the interim results announcement for Hutchison Whampoa, Li endorsed Henry Tang for the forthcoming chief executive election. Then Li said "You all can be just like me, one-person-one-vote (一人一票)." The media then looked at Li in disbelief, and pointed out that regular citizens do not get one-person-one-vote. Li then tried to laugh it off and said "maybe in 2017 they will have one-person-one-vote to choose the chief executive, I probably just said it a little early." Li was, however, criticised by Xinhua for not being unambiguous in his opposition to the Umbrella movement protests and his support for Leung. Later, prior to the Legco vote, Li said that the largest threat to Hong Kong's future was if the government failed to ensure passage of the 2014–5 round of political reform. Li's business empire has presence around the world, including China. Li came under attack from Global Times in early 2015, when his companies put out word that it was considering selling prime Shanghai and Beijing properties. It became apparent that Li aimed at re-weighting his asset portfolio to more stable and transparent markets in the West. Concerted attacks ensued and went into a crescendo as China's economy slowed down dramatically in the second half, and the central government sought a way to stem the capital outflows. Specific reproaches were that his asset disposals were "an act of ingratitude" and "immoral at such a sensitive juncture". Security Times, a People's Daily publication, estimated that Li has sold at least 73.8 billion yuan worth of assets since 2014. Li's holding companies denied divesting in China, saying that its asset disposals were being undertaken in the ordinary course of business. The attacks stopped abruptly several weeks later, when editorials in official publications such as People's Daily, Beijing Youth Daily took a neutral stance in unison. Li's donation in 1981 resulted in the founding of Shantou University (STU) and the Shantou University Medical College, near his hometown of Chaozhou. Li has earmarked grants of HK$8 billion through 2018 to develop STU. In 2013, Li granted US $130 million to establish the Guangdong Technion - Israel Institute of Technology in Guangdong Province as a joint venture between Technion - Israel Institute of Technology and Shantou University. 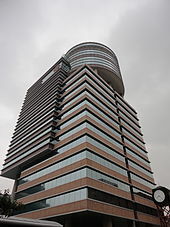 In September 2001, the newest tower in the Hong Kong Polytechnic University was named after Li, following a HK$100 million donation to the University. The Li Ka Shing Centre in Cambridge, England, houses a Cancer Research UK facility, which is a part of the University of Cambridge. The Centre was named after Mr. Li following a £5.3 million donation, and was opened in his presence in May 2002. The Li Ka Shing Foundation endowed a professorship of oncology at the university in 2007 with a subsequent gift of £2 million. In November 2002, the Cheung Kong Graduate School of Business in China was founded with a large donation from the Li Ka Shing Foundation. The Li Ka Shing Library at the Singapore Management University is also named in his honour after a US$11.5 million donation in 2002 to the higher education institution. After the 2004 Indian Ocean earthquake disaster, Li reportedly pledged a total of US$3 million. In 2005, Li announced a HK$1 billion (US$128 million) donation to the Faculty of Medicine, University of Hong Kong. It was renamed to Li Ka Shing Faculty of Medicine on 1 January 2006, which provoked controversy between the university and quite a number of alumni of the faculty, notably Kwok Ka Ki, over the university's naming procedures. Also in 2005, Li donated US$40 million to the University of California, Berkeley, citing that he was impressed with the university's accomplishments in the biosciences. In recognition of Li's donation, the university has named the campus' new biosciences facility the Li Ka Shing Center for Biomedical and Health Sciences, which opened in October 2011. In 2014, The Li Ka Shing Foundation provided a US$10 million gift to support UC Berkeley and UC San Francisco to jointly launch the Innovative Genomics Initiative (IGI), based on a new technology discovered at UC Berkeley by Professor Jennifer A. Doudna, executive director of the initiative. In the same year, the Li Ka Shing Foundation has also provided $3 million to Stanford University for exploring new ways of utilising biomedical data to improve human health. A long-time supporter of Stanford University since the 1980s, Li is the principal benefactor to the US$90 million Li Ka-shing Center for Learning and Knowledge, which opened in Fall 2010 and is now the headquarters for the Stanford University School of Medicine. On 9 March 2007, Li Ka-shing contributed SGD$100 million to the Lee Kuan Yew School of Public Policy in the National University of Singapore. Also, "to honour and recognize Dr. Li's support and generosity, LKY SPP will name one of its three buildings at the historic Bukit Timah Campus after him". Li Ka-shing donated C$25 million to St. Michael's Hospital in Toronto to found the Li Ka-Shing Knowledge Institute, which will serve as a medical research and education centre in downtown Toronto. Li Ka-shing donated C$28 million to the University of Alberta to found the Li Ka-shing Institute of Virology. Li Ka-shing donated C$6.6 million to McGill University in 2013 to establish three exchange programs: the Li Ka Shing Initiative for Innovation in Legal Education, the Li Ka Shing Liberal Arts Exchange Initiative and the Li Ka Shing Program in International Business between McGill and Shantou University. In 2013, Li Ka-shing donated US$2 million to the University of California, San Francisco to support their advance precision medicine initiative. The funds will be used to build a worldwide network of clinicians and researchers, launch leadership exchanges between UCSF and China, and create a systems-pharmacology program to develop more precise medications. With a donation from Li of over HK$1.7 billion, Tsz Shan Monastery was developed over a period of ten years as an institute of Chinese Buddhist practice and education as well as a place for spiritual contemplation. It was opened to the public in April 2015. (Hong Kong, 28 April 2015) In the aftermath of the devastating 7.8 magnitude earthquake that struck Nepal and its neighboring regions, the Foundation has made a donation of US$1 million from its Just In Time Fund to provide immediate aid to help ease human suffering and to support ongoing relief efforts in Nepal. In 2017, with the support of a £20 million gift from the Li Ka Shing Foundation, Oxford University launched the Big Data Institute. The centre gathers researchers to analyse worldwide biomedical data and catalyze the development of new treatments for cancer, Alzheimer’s and several infectious diseases. In 2018 Li Ka Shing donated HK$10 million to Food Angel , a program that provides hot meals for people in need. In 2018 Li Ka Shing Foundation and CK Hutchison Holdings donated US$ 5 million for Palu-Donggala disaster relief, after Tsunami and Earthquake in Indonesia. ^ "Li Ka-Shing". Nndb.com. Retrieved 11 May 2011. ^ a b "Li Ka-shing". forbes.com. Retrieved 23 March 2019. ^ a b "SUPPLEMENT No. 1 to Issue 55879", London Gazette, 19 June 2000, p. 24. ^ "Silobreaker: Biography for Li Ka-Shing". Silobreaker. 26 September 2006. Archived from the original on 6 January 2009. Retrieved 12 June 2008. ^ "Li Ka-shing". Encyclopædia Britannica. Chicago, Illinois: Encyclopædia Britannica, Inc. Retrieved 12 June 2008. ^ Stevenson, Alexandra (16 March 2018). "Li Ka-shing, Hong Kong's Richest Man, Will Retire, Ending an Era". The New York Times. ISSN 0362-4331. Retrieved 22 March 2018. ^ "The World's Billionaires No. 11 Li Ka-shing". Forbes. 5 March 2008. Retrieved 1 December 2008. ^ Martins, Ajaero. "How Li Ka Shing became Asia's Most Influential Business Man". ^ Schuman, Michael (24 February 2010). "The Miracle of Asia's Richest Man". Forbes. Retrieved 28 February 2012. ^ Wilhelm, Ian (20 September 2007). "Building a Spirit of Generosity". Philanthropy.com. Archived from the original on 13 November 2009. Retrieved 28 February 2012. ^ Schuman, Michael (24 February 2010). "The Miracle of Asia's Richest Man". Forbes. ^ Studwell, Joe. "Money and Power in Hong Kong and South-East Asia". Asian Godfathers. Retrieved 16 July 2012. ^ Einhorn, Bruce; Ho, Prudence. "Hong Kong's Richest Man Li Ka-shing Retires". Bloomberg. Retrieved 14 December 2018. ^ "CK Hutchison Holdings Limited – About Us > Milestones". ckh.com.hk. ^ a b c "李嘉誠替唐英年解畫5分鐘 – 新浪網 – 新聞". Sina Corp. Archived from the original on 28 September 2012. Retrieved 5 August 2011. ^ "Li Ka-shing, Jack Ma Join Forces to Bring Digital Wallet to Hong Kong". Bloomberg.com. 26 September 2017. ^ Pham, Sherisse. "Hong Kong's 'Superman' tycoon Li Ka-shing to retire at 89". CNNMoney. Retrieved 17 March 2018. ^ "Li Ka-Shing". Harvardbusinessonline.hbsp.harvard.edu. Retrieved 2 November 2015. ^ Ap (29 March 1984). "JARDINE OF HONG KONG PLANS SHIFT TO BERMUDA" – via NYTimes.com. ^ a b "Billionaire Pares Real Estate Holdings With Sale of Hong Kong Skyscraper". Caixin Global. 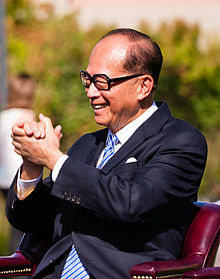 ^ "Li Ka-shing to sell stake in HK skyscraper for record $5.2bn". Financial Times. ^ "Mr. Li Ka-shing buys a substantial shareholding in HWL from the Hongkong and Shanghai Bank, thus becoming the first Chinese to take control of a British-style 'hong'". Milestone of Cheung Kong Holdings. Retrieved 31 August 2017. ^ Tony Munroe (12 February 2007). "Hong Kong "Superman" Li Ka-shing cashes in". Reuters. Retrieved 29 December 2008. ^ Judge, Elizabeth; Oconnor, Ashling (12 February 2007). "Vodafone beats rivals for Hutchison Essar". The Times. London. Retrieved 7 May 2010. ^ "British teenage designer of Summly app hits jackpot". BBC News. ^ Lee, Mark (24 August 2012). "Li Ka-Shing Acquires Stake in Language Company Ginger". Bloomberg L.P. Retrieved 13 September 2012. ^ "Peripheral bitcoin services like BitPay safer investment than bitcoin: economist". South China Morning Post. Retrieved 26 December 2013. ^ Gage, Deborah (4 February 2015). "Fast-Growing Zoom Raises $30 Million for Online Video Conferencing". The Wall Street Journal. ^ Connie Loizos (6 October 2015). "Impossible Foods Raises a Whopping $108 Million For Its Plant-Based Burgers". Techcrunch. ^ "Blockstream Announces $55 Million Series A Investment Bringing Total Capital Raised to $76 Million". Horizons Ventures. 3 February 2016. ^ Jordan Crook (30 March 2016). "Expa opens up Expa Labs giving companies $500K in funding". Techcrunch. ^ "Voluntary Disclosure Announcement" (PDF). Voluntary Disclosure Announcement. 28 June 2013. ^ "Settlement of Australian Tax Dispute" (PDF). Settlement of Australian Tax Dispute. 19 June 2015. ^ Stevenson, Alexandra (16 March 2018). "Li Ka-shing, Hong Kong's Richest Man, Will Retire, Ending an Era". The New York Times. ISSN 0362-4331. Retrieved 17 March 2018. ^ News, ABC. "Hong Kong tycoon Li Ka-shing retires shy of 90th birthday". ABC News. Retrieved 17 March 2018. ^ "Billionaire tycoon Li Ka-shing retires, hands control of empire to son". South China Morning Post. 16 March 2018. Retrieved 17 March 2018. ^ Kroll, Luisa. "Hong Kong's Richest, Li Ka-shing, Announces Plans To Retire After 68 Years". Forbes. Retrieved 17 March 2018. ^ "Husky slashes production target". The Globe and Mail. Canada. Retrieved 28 February 2012. ^ Schuman, Michael (24 February 2010). "The Miracle of Asia's Richest Man". Forbes. Retrieved 9 June 2010. ^ "Why Hong Kong's Richest Man Wears a $500 Watch" – via www.bloomberg.com. ^ a b "Kidnapper of Li Ka-shing's son rang tycoon to ask where he should invest HK$1billion ransom." Mimi Lau. South China Morning Post. 29 November 2013. ^ "暗撐唐英年 2017人人可選特首". Hkdailynews.com.hk. Archived from the original on 28 February 2012. Retrieved 5 August 2011. ^ "成報 www.singpao.com". Sing Pao. Archived from the original on 27 September 2011. Retrieved 5 August 2011. ^ "暗撐唐英年 2017人人可選特首". Hkej.com. 5 August 2011. Retrieved 5 August 2011. ^ "李嘉誠指普選特首時他同大家一樣是一人一票". Commercial Radio (HK). 5 August 2011. Archived from the original on 19 March 2012. ^ Chu, Kathy; Law Fiona (28 October 2014). "Hong Kong Tycoons Pressed on Protests". The Wall Street Journal. ^ "Li Ka-shing says biggest threat to Hong Kong is failure of universal suffrage bill". Business Insider. 26 February 2015. Retrieved 3 December 2015. ^ a b c d "Beijing emerges badly from its censure of tycoon". EJ Insight. ^ "China media attacks Li Ka-Shing – Business Insider". Business Insider. 22 September 2015. Retrieved 3 December 2015. ^ "CKHH/CKPH Media Response" (PDF). 29 September 2015. ^ "PolyU names new tower after Li Ka-shing". Hutchison Whampoa Limited (HWL). 19 September 2001. Retrieved 10 October 2012. ^ "State-of-the-Art Cancer Research Centre Opens in Cambridge Supported by a £5.3 million donation from Hutchison Whampoa". Lksf.org. Archived from the original on 11 October 2011. Retrieved 28 February 2012. ^ Sanders, Robert (23 June 2005). "$40 million gift from Li Ka Shing Foundation boosts health science research". UC Berkeley Media Relations. Retrieved 12 May 2009. ^ "Stanford medical school building to promote high-tech learning – with comfort". Inside Stanford Medicine. 10 May 2010. Archived from the original on 12 December 2013. Retrieved 8 December 2013. ^ "LKY School of Public Policy receives $100 million from business leader". National University of Singapore. 12 March 2007. Archived from the original on 12 March 2007. ^ "Li Ka Shing Knowledge Institute – St. Michael's Hospital". Stmichaelshospital.com. Retrieved 28 February 2012. ^ "LKSF gift and Alberta Government funding help establish virology institute at U of A". Retrieved 14 September 2017. ^ "Hong Kong makes voluntary donations for Sichuan earthquake". Xinhua News Agency. 14 May 2008. Archived from the original on 7 November 2012. Retrieved 28 February 2012. ^ anonymous. "Building bridges across the Pacific - Channels - McGill University". ^ "Li Ka Shing Gift Supports UCSF Quest for Precision Medicine". UCSF. 22 March 2013. Retrieved 8 December 2013. ^ "Earthquake Relief in Nepal - Li Ka Shing Foundation". ^ "HK joins global relief efforts for quake-hit Nepal". 29 April 2015. ^ "Li Ka Shing Foundation donates US$3m for precision oncology | University of Melbourne Alumni". www.alumni.unimelb.edu.au. Retrieved 10 November 2018. ^ "World's largest health big data institute opens in Oxford | University of Oxford". www.ox.ac.uk. Retrieved 14 November 2018. ^ "Li shows common touch in angelic gesture". The Standard. Retrieved 21 November 2018. ^ Mediatama, Grahanusa (8 October 2018). "Hong Kong's richest man donate US$ 5 million for Palu-Donggala disaster relief". kontan.co.id. Retrieved 15 November 2018.